I suspect that you, like me, are busy enjoying the summer season, and your plans are getting pretty complicated, getting out on family holidays and taking some vacation days while still trying to keep up with community plans and projects. In the midst of all this, my inbox of email and local news has also been busy, and I want to take a moment to share some of that news. Blake Trask, Washington Bikes State Policy Director writes: "The transportation package – finally passed by the Washington State Legislature after our intensive lobbying through the regular session and three special sessions – establishes a set of investments at levels never before seen in our state. In total, the 16-year package contains approximately $500 million to make biking better and Washingtonians safer. These investments represent a sevenfold increase from the last transportation package, passed in 2005. That funding bill contained commitments of only $72 million for biking, walking, and Safe Routes to Schools over a similar 16-year period." Russ Bosanko, Snohomish County Parks & Recreation Division Manager for Park Capital and Operations, writes: "Please see information below that I shared with the Park Advisory Board yesterday….the only request that we did not get was the restrooms at Whitehorse Community Park. · RCO grants for Cavelero ( $500,000), Esperance ( $508,600), Hooven Bog ( $492,750), Lake Stickney ( (295,000), Wenberg ( $614,000 + 592,599), Whitehorse Trail ( $1.1million + $1,000,004) for a total of $ 5,102,953." "Published: Wednesday, July 15, 2015, 12:01 a.m. ARLINGTON — Local parks, trails, ballfields and the crowded Boys & Girls Club building are about to be upgraded thanks to a state spending package focused on young people in the Stillaguamish Valley. 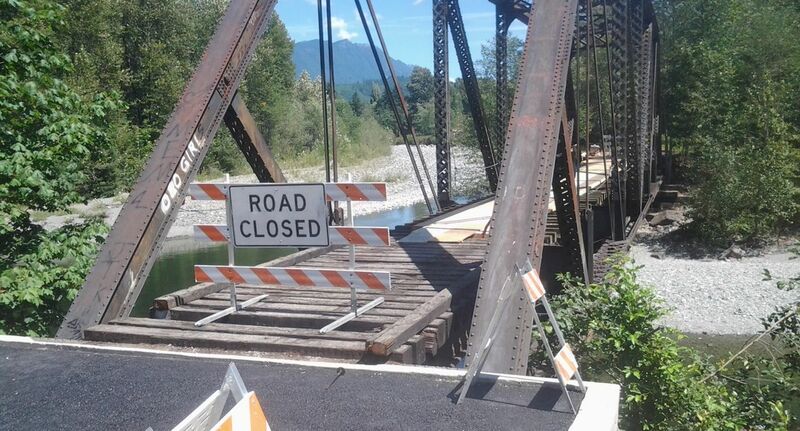 ...."Another $1 million has been set aside for the Whitehorse Trail, a 27-mile-long corridor between Arlington and Darrington. Officials have been talking about paving the entire stretch, Klein said. “That would be huge for bicyclists,” he said." 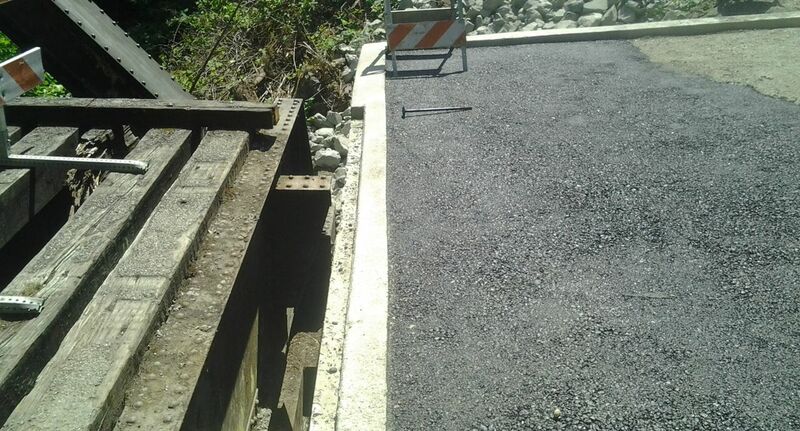 "Published: Tuesday, June 23, 2015, 12:01 a.m. EVERETT — When Snohomish County leaders got word this week that Uncle Sam would cut a multimillion-dollar check for Oso mudslide expenses, it was welcome news.....Rebuilding the recreational Whitehorse Trail through the slide area is expected to cost $1.4 million and isn’t expected to start until next year, he said." An example of the degraded state of the old bricks. Members of the Centennial Trail Coalition were also busy making improvements at the Resilience Plaza, the junction of the Whitehorse Trail and the Centennial Trail where there is a very nice arch and the location for commemorative bricks. 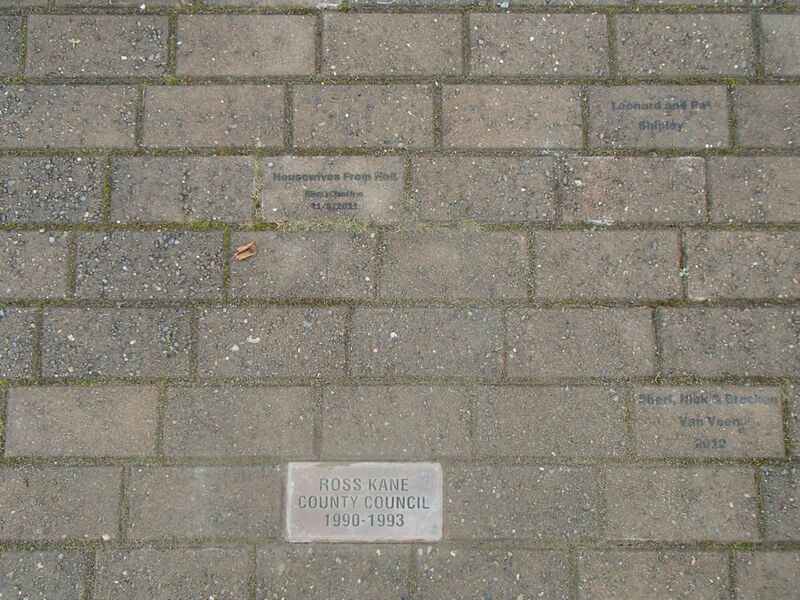 The CTCSC board had noticed that the original bricks that were engraved and placed were not holding up well. After consulting with Artistic Sandblasting NW, we found a better brick and decided to invest in upgrading all of the engraved bricks at Resilience Plaza. Even with an early morning start, it was hot work on two separate days, taking out the old bricks and putting in the more nicely engraved new bricks. 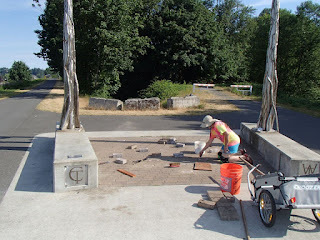 Take time to visit the plaza just north of Haller Park and the bridge over the Stillaguamish River. 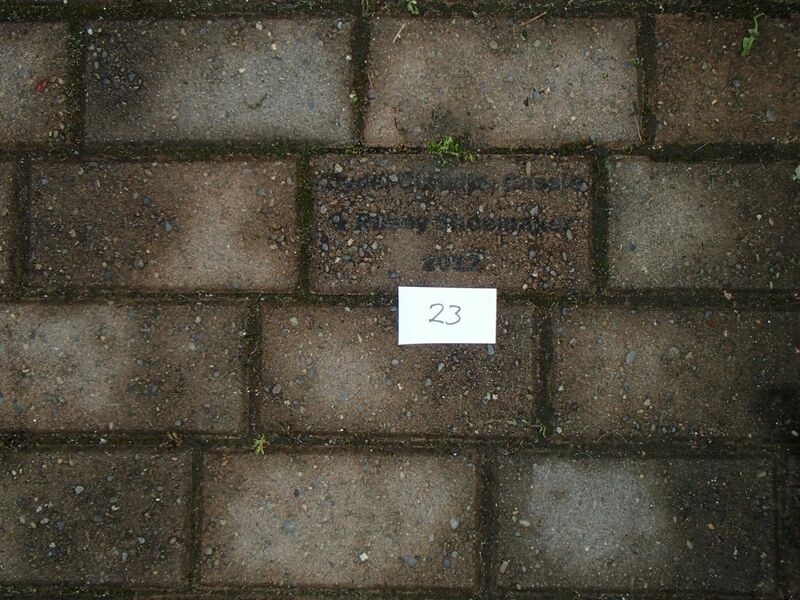 There is lots of space for more engraved bricks. 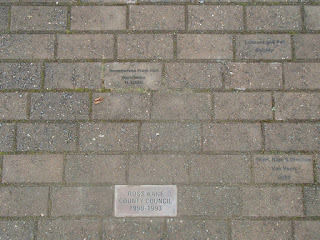 We enjoy the recognition of many who have helped make the Centennial Trail possible, and there are other bricks that just remember family members or special events. We love to see all the art that enhances the trail, and this is fine part of that. And a special big thanks to Bernie at Artistic Sandblasting NW for her generous help and consultation. The decking project for bridges on the Whitehorse Trail continues on pace to be completed this year. 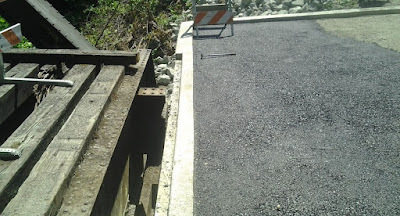 Snohomish County Public Works is currently doing some very nice work armoring the abutments and decking the bridge at Oso where the Whitehorse Trail crosses Deer Creek. The old railroad bridges are in remarkably good shape considering many of them may be approaching their 100th anniversary. Where needed, the Public Works engineers are installing new timbers, I-beams, and support structures.